Microbiology and Molecular Biology Team, Center of Plant and Microbial Biotechnology, Biodiversity and Environment. Faculty of Sciences, Mohammed V University in Rabat, MOROCCO. 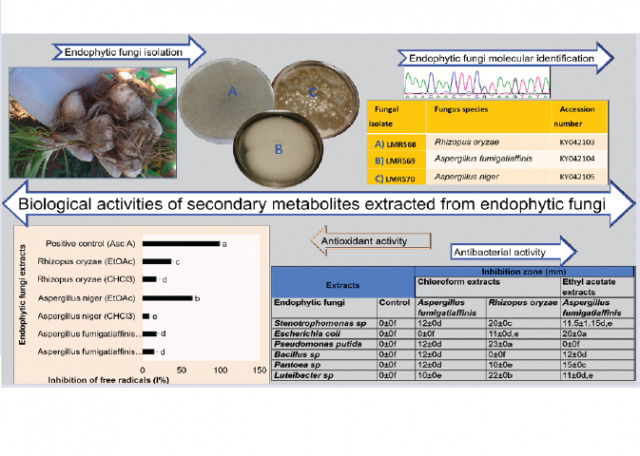 Introduction: Endophytic fungi are becoming an important source of new natural bioactive products. Many interesting endophytic fungi have been isolated from traditional medicinal plants. Crocus sativus L. (saffron) is one of the most expensive and rarest spices in the world, used as a dye, aroma and for medicinal purposes. This study reports on the molecular characterization of endophytic fungi isolated from roots of saffron plants growing in Taliouine- Morocco, and the examination of the antibacterial and antioxidant activities of secondary metabolites extracted from these endophytes. Methods and Material: The fungi were isolated from sterilized saffron root fragments and identified using internal transcribed spacer (ITS) rRNA gene sequence analysis. Three endophytes were fermented and extracted with ethyl acetate (EtOAc) and chloroform (CHCl3). The antibacterial activity of fungi extracts was evaluated using the Agar Diffusion Method against six strains, Bacillus sp., Stenotrophomonas sp., Pseudomonas putida, Pantoea sp., Luteibacter sp. and Escherichia coli. The antioxidant activity was tested by using the α,α-diphenyl-β-picrylhydrazyl (DPPH) analysis and β-Carotene bleaching test (BCBT) methods. Results: Sixty fungal isolates were recovered and purified from saffron roots. ITS rDNA sequences were 99-100% identical to three different species: Rhizopus oryzae, Aspergillus fumigatiaffinis and Aspergillus niger. Both Rhizopus oryzae extracts had high antibacterial activity against most of the bacteria tested, while Aspergillus niger and Rhizopus oryzae extracts showed an antioxidant capacity using DPPH and BCBT methods, respectively. Conclusion: The fungal endophytes inhabiting saffron roots could be a potential source of natural plant bioactive secondary metabolites especially for antibacterial and antioxidant purposes. Chamkhi I, Sbabou L, Aurag J. Endophytic Fungi Isolated from Crocus sativus L. (Saffron) as a Source of Bioactive Secondary Metabolites. Pharmacognosy Journal. 2018;10(6):1143-1148.